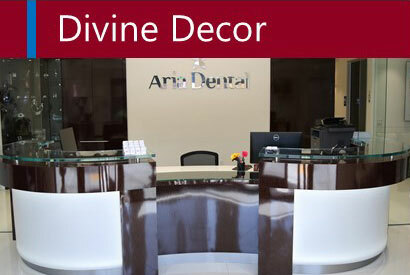 Walking into Aria Dental Is Like Walking into the Open Arms of Comfort & Elegance. 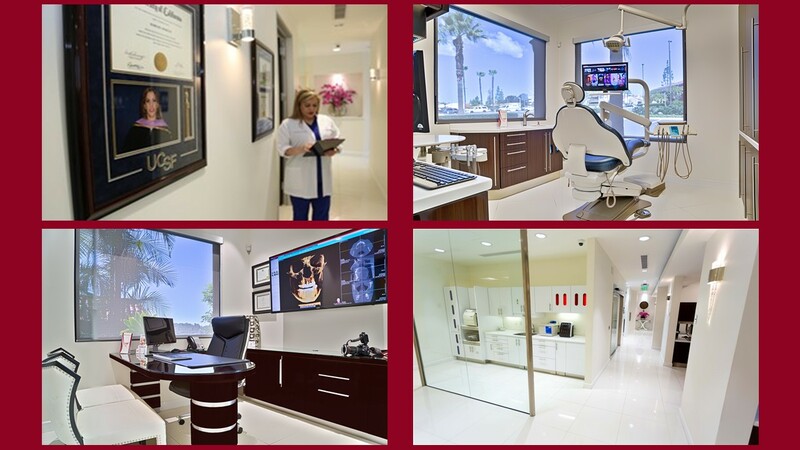 Our family & cosmetic dentist, Dr. Maryam Horiyat, was able to combine modern sophistication with tranquility and serenity, thanks to the choice of architecture, décor interior designer, and stylish, state-of-the-art equipment that provides the optimum dental experience for all residence of Orange County. Aria Dental's ambiance is so soothing and serene that you would feel like you are walking into a chic spa. Make an appointment and visit us. Smooth line and calming light walls are the foundation of our dental office design and décor establishing a contemporary, yet warm sensation throughout the entire office. Our open-air layout and large windows to combine natural light with our soothing and balanced interior lighting create a sense of harmony and relaxation. The combination of vibrant and airy ambience contrasts precisely with dark wood cabinets and pure glass accent created remarkable balance that leaves you feeling tranquil, relaxed, grounded, and secure. With Massaging & heating dental chairs, flower fragrance ambiance, relaxing music in the background, while you are facing sunny skies or softly wafting clouds of Orange County, it is difficult not to relax. Dr. Horiyat employs the most advanced dentistry, which means only the most advanced equipment & technology will do. She diligently selected high-end equipment, but her focus remained at her patients’ serene and soothing feelings. A Combination of the chilled, purified mountain fresh air of our treatment rooms, padded heated/massaging dental chairs, and warm-heated blanket matches the overall sophisticated and elegant ambiance infused through the rest of our dental office. Our primary Goal: Cleanliness, sterile and inspired atmosphere will pacify the senses and provide you with truly comfortable and secured experience. Our skilled staffs are dedicated to your safety and well-being via our advanced and modern sterilization system that surpasses OSHA requirements. At our dental office’s concierge, serving you with refreshments like Starbucks Cappuccino, cafe latte, and fruit juice by our wonderful staff will bring you coziness and courtesies before your dental appointment. Relaxing in a massaging dental chair and watching a movie from hundreds of movie selection on the ceiling flat screens, while you listen to the surround sound through wireless headphones makes you feel you are in your comforting home. Completing your dental treatment with a fresh scented ambiance, warm towel is our gift to you for your trust in us. Please call us at (949) 364-9600 or for an appointment with the best cosmetic dentist in Orange County. Mission: Our mission is to optimize your oral health and the beauty of your smile in a serene and tranquil ambience through affordable and safe dentistry and utilizing advanced technology by highly skilled, trusted dental professionals. 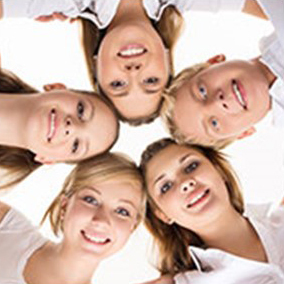 Purpose: Our purpose is to give all our patients at any age the very finest dental experience. Vision: Our vision is to be recognized by our patients and dental industry as the country’s leading dental practice. The professional team behind Aria Dental strives to guarantee to patients' meticulous service of premium quality of multi-specialty dental care through the highest level of technology and high experienced team. Our core purpose is to provide an exceptional and comprehensive dental care with successful clinical outcomes to our patients while educating them along a path of optimal oral health and wellness for life. 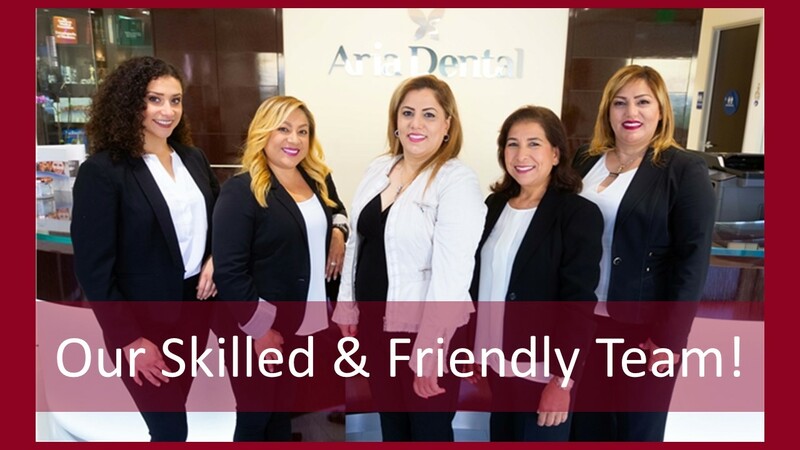 Aria Dental is a group of ambitious people committed to excellence, professionalism, and spiritual growth, and bound together by a commitment to provide high quality and efficient dental care in our diversified community. Aria Dental will continuously strive to outreach our community, improve the quality of their performance, and exemplify the integrity, ethic, and excellent values. One of the priorities of Aria Dental is to form long-term personal relationships based on trust and confidence by valuing patient loyalty and focusing our efforts on making a personal connection. We are persistent to give our patients undivided attention and focus on patients’ needs with flexibility, efficiency, and individualized care. Humanism: Trust, dignity, integrity, ethics, and loyalty. Leadership: Visioning, contagiously inspiring, and mobilizing value. Innovation: Willingness to take planned risks and to be an innovative leader. Quality: What we do, we consistently do it with traditional human values and rigorous standard. Productivity: Act with urgency, be highly effective, and remain a lean and fast-moving organization.